See the Anchorage Daily News op-ed [Dead link- this op-ed is no longer online] from March 16, 2010 by financial analyst Jamie Kenworthy of Anchorage. Using the latest information on interest rates, the linked factsheet uses Knik Arm Bridge and Toll Authority (KABATA) data to show that the bridge’s deficit exceeds Anchorage’s transportation expenditures for the first 9 years of bridge operation, and then jumps even higher during year 10 when Phase 2 construction begins. KABATA has not produced any information that refutes this analysis. 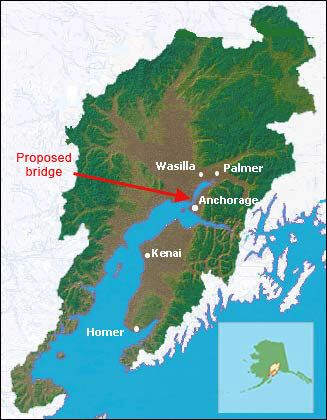 In a surprising move, the Parnell Administration on February 16, 2010 issued a brief letter stating a new position on the proposed Knik Arm Bridge. The Administration’s new position is contrary to that taken by its regional transportation staff to date. The new position – that the Knik Arm Bridge remain as a short-term project in the Anchorage Long Range Transportation Plan (LRTP) – conflicts with the regional transportation staff’s position as late as February 11, 2010, i.e., that the bridge be moved to the long-term in the LRTP. Regional transportation staff arrived at that position after an extensive, fact-based public hearing process. The Administration’s February 16th letter destroys a carefully-crafted consensus approved unanimously by the Anchorage Assembly and the Anchorage Metropolitan Area Transportation Solutions (AMATS) Technical and Policy Committees in 2009. By a vote of 10-1 on February 11, 2010 with the Alaska Railroad Corporation the only dissenter, the Anchorage Metropolitan Area Transportation Solutions (AMATS) Technical Advisory Committee [Dead link- this information is no longer online] recommended that the Knik Arm Bridge become a long-term project in Anchorage’s Long Range Transportation Plan. This vote means that construction would not begin until 2018 or later. The AMATS Technical Advisory Committee recommendation now goes to the Anchorage Assembly for a vote in March. Following the Assembly’s action, the AMATS Policy Committee [Dead link- this information is no longer online] will consider whether or not to adopt the recommendation. The University of Alaska Anchorage Institute for Social and Economic Research (ISER) issued new state and Anchorage-region population projections in its December 2009 report entitled Economic and Demographic Projections for Alaska and Greater Anchorage 2010-2035 by Scott Goldsmith. Key changes from the ISER 2005 population projections developed for the Knik Arm Bridge and Toll Authority are reductions in population projections for the state (-43%), for Anchorage and the Mat-Su together (-38.5%) and for the Mat-Su (-34.755%). See p. 69 for summary tables. With a 7-1 vote and 1 recusal, on December 7, 2009 the Anchorage Planning and Zoning Commission (P & Z) reaffirmed the position it took earlier this year to remove the proposed bridge from Anchorage’s Long Range Transportation Plan (LRTP). P & Z decided not to approve the Municipality of Anchorage’s request to move the bridge from the short-term to the long-term phase of the LRTP. Instead, P & Z recommended removing the project from the LRTP because it does not meet P & Z’s mandate to promote implementation of Anchorage 2020, the community’s comprehensive plan. P & Z was concerned that if this project remained in the LRTP, Anchorage would have inadequate leverage to ensure that its needs – including the Phase 2 connection to Ingra-Gambell – would be met. P & Z also added to and modified its earlier Findings in support of this recommendation. Click here [Dead link- this resolution is no longer online] for the December 7, 2009 P & Z resolution. Click here [Dead link- this memo is no longer online] for the Municipality of Anchorage’s November 24, 2009 memo to P & Z. The Anchorage Assembly and the AMATS Policy Committee need to reaffirm their decisions from earlier this year to postpone Knik Arm Bridge construction until 2018 or later in Anchorage’s Long Range Transportation Plan. The reason they must redo these decisions is that Wasilla, Houston, and the Knik Arm Bridge and Toll Authority (KABATA) sued the Policy Committee over the public involvement process. Although there was no finding of wrongdoing, the lawsuit settlement required the public involvement process to be redone a second time. As shown in the documents below, KABATA has no plan to address bridge costs without a state or local revenue guarantee of over $400 million dollars through year 19 of bridge operation. “Knik Bridge lawsuit settled.” To view this 8/19/09 ADN story, please click here [Dead link- this story is no longer online]. 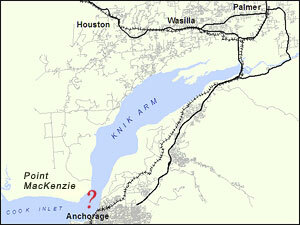 “Knik Arm Project Delayed.” To view this 6/25/09 KTVA story, please click here. The Anchorage Metropolitan Area Transportation Solutions (AMATS) Technical Advisory Committee, composed of state, municipal, and public members, unanimously recommended to the AMATS Policy Committee on June 18 to move the Knik Arm Bridge from the list of short-term projects (2007-2017) to the list of long-term projects (2018-2027) in Anchorage’s Long Range Transportation Plan.